Auction activity across the combined capital cities increased this week, up from 2,409 auctions last week, to 2,794 this week, making it the sixth busiest week this year. This week’s weighted average clearance rate across the combined capitals was 77.2 per cent, increasing from a final clearance rate of 72.8 per cent over the previous week, while at the same time last year, both volumes (1,920) and the clearance rate (68.9 per cent) were lower. The two largest auction markets, Melbourne and Sydney, saw their preliminary clearance rates rise, with Sydney at 80.7 per cent and Melbourne at 79.2 per cent, although Sydney, and to a lesser extent Melbourne, tend to revise down over the week when the remaining results are captured. Over the previous week, Sydney’s preliminary clearance rate of 79.4 per cent was revised down to 74.5 per cent when finalised. Across the smaller capital city markets, Brisbane was the only city where preliminary clearance rates fell week-on-week so again it will be interesting to see how the clearance rates hold when the final figures are released on Thursday. There were 1,323 auctions held in Melbourne this week with a preliminary clearance rate of 79.2 per cent. This week’s result shows a rise in the clearance rate for the city, after Melbourne’s final clearance rate was recorded at 75.0 per cent last week, the lowest clearance rate for the city so far this year. Over the same week last year, Melbourne’s clearance rate was 70.0 per cent across 843 auctions. Of the Melbourne sub-regions, 7 of the 9 regions recorded clearance rates at or above 75 per cent, with the highest clearance recorded across the Outer East, with preliminary results showing 87.8 per cent of the 98 results were successful, followed by the North East where 81.7 per cent of auctions cleared. Sydney was host to 1,053 auctions this week and a preliminary clearance rate of 80.7 per cent was recorded, rising from 74.5 per cent last week across 960 auctions. One year ago, 735 auctions were held across Sydney and 73.2 per cent were successful. Looking at the sub-regions of Sydney, 8 of the 15 sub-regions recorded clearance rates of at least 80 per cent with the stand outs being the Inner West (88.9 per cent), Sutherland (88.6 per cent), North Sydney and Hornsby (88.6 per cent) and Eastern Suburbs (88.0 per cent) regions. There were 160 Brisbane homes taken to auction this week, with 93 results reported so far. The preliminary clearance rate for the city is 51.6 per cent, down from 59.0 per cent last week and similar to one year ago, when 50.9 per cent of the 131 properties taken to auction were successful. Across the Gold Coast 20 results have been reported so far, with a success rate of 45.0 per cent (9 sales). In Adelaide, a 70.4 per cent preliminary result was recorded this week across 114 auctions. Last week, 102 Adelaide auctions returned a clearance rate of 63.0 per cent for the city, while at the same time last year, 92 homes were taken to auction, with 68.8 per cent recording a successful result. 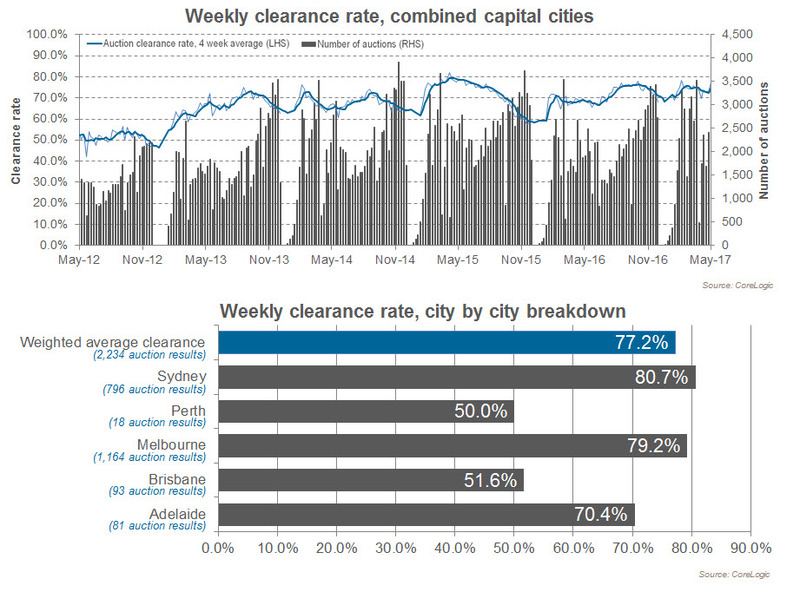 Perth’s preliminary clearance rate was 50.0 per cent this week, up from 42.1 per cent last week. This week 48 Perth homes were auctioned, while 18 results have been reported so far. At the same time last year, 42.9 per cent of Perth auctions cleared. Across Canberra, 85 homes were taken to auction this week. Preliminary results show a clearance rate of 75.3 per cent, up from 74.3 per cent the previous week. Tasmania was host to 11 auctions this week and so far 5 have been reported with 4 sales.